Welcome to the island of the co-existence of the most contrasting opposites: Green pine forests combined with harsh, arid wilderness, traditional customs together with modern infrastructure, pious, reverent Christians being transformed into Dionysian festival participants, the most appealing myths together with the most appalling historic adventures; unbreakable ties with the past immersed into the dawn of mankind, sustaining a present full of aspirations for the future. 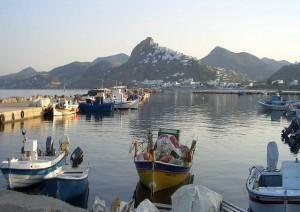 Twenty-four miles away from the coast of Euboia and its port of Kymi lies Skyros. You may have come here by plane or on board the “Achilles” ferry, after a one and a half -hour relaxing voyage. Some 2600 people, trying to make a living on fisheries, animal husbandry and tourism, are here to help you, but, at the same time, they respect your privacy and let you relax and enjoy your vacation. The very name of the island, Skyros, comes from the ancients, as the island was called by the same name thousands of years ago. There are fantastic beaches if you like to work on your tan and swim, wild coastlines if you prefer rock diving or snorkeling and exploring the marvels of the sea bed. There are innumerable, interesting walking trails, should you like to explore the Mediterranean maquis vegetation of the scrubland in the southern part of the island, which is composed primarily of leathery, broad-leaved evergreen shrubs or thorny bushes. Its imposing castle and its history, the numerous chapels, and the old episcopal church up in the 9th century fortress are thrilling attractions for the visitor and cultural jewels for the island and its people. Whether windsurfing, spear fishing or tracer fishing, beach sports, scuba diving, sailing, trekking, museum visits, sea cave exploration, clubbing until dawn, or just reading a book, all will contribute to an unforgettable visit. A delightful complex of two beautiful buiildings connected to a gorgeous garden of herbs, flowers and fruit trees, the Ariadne Studios provide the perfect atmosphere for relaxation, with easy access to the beach and tavernas. This small hotel offers very spacious rooms in a countryside setting, and with a swimming pool and pool bar. The larger village of Magazia is about 800 meters from the hotel, where you'll find shops and restaurants.